My kid associates these with vacations, because that's when she gets them. Put down that phone, this isn't a case for Child Protective Services. Though the information was apparently available in December, news stations with little else to say this morning were reporting that the Environmental Working Group released a report you can download from their web site about the sugar content of many breakfast cereals (with a list of the 10 worst, below). They also recommend some of the best cereals including Cheerios, Kix, Mini-Wheats and really really good stuff like Nature’s Path Puffs and granolas free of GMOs and pesticides. How to judge sugar content: For every 4 grams of sugar listed on a food label, there’s 1 teaspoon of sugar. Froot Loops has 12 grams of sugar per 1 cup serving (heaven help you if you’re filling the bowl to the rim before adding milk). That’s a tablespoon of sugar per cup (because 3 teaspoons = 1 tablespoon — good to know!). 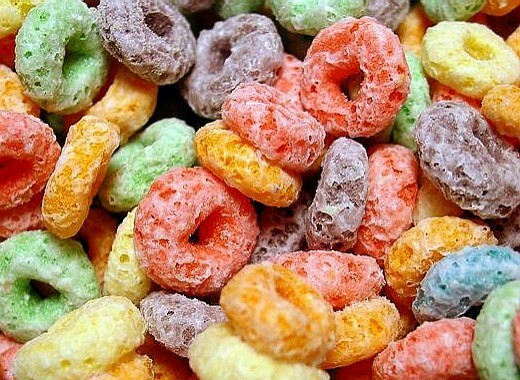 Although food labels count fruit sugars under that Sugars heading, there’s no fruit lurking in Froot Loops or many of the other cereals packing loads of refined sugar. That means you are relying on fortification (added vitamins and minerals) for any nutrition. Also, if the first or second ingredient is sugar, cane syrup, glucose, high fructose corn syrup, concentrated pear juice or the like, you’re going to be flying after eating the stuff. When you consume a large dose of sugar, your body’s pancreas has to make a lot of insulin. Insulin tells the cells in your body to go ahead and get all that sugar out of your bloodstream and into cells. When there’s so much sugar floating around in the bloodstream at once, the cells take up loads of glucose; sometimes a little too much. During the time it takes to release a little bit back into the blood stream, your brain registers hunger. This usually coincides with the moment you’ve completed about an hour’s work, the whole day still ahead of you, and Candy Dish lady has just arrived with a couple dozen donuts for that snoozer of a meeting. There isn’t a bookie in Vegas that would give odds against a 10 am meetup between you and that chocolate covered sweetie. But you’re not really hungry in the morning and that crappy kid cereal is all you can stomach, or you just aren’t very organized and eating well takes too much work. Nah. If you’re rich, you can stop at Starbucks and they’ll make you a little oatmeal in a cardboard cup to take along with your jet fuel. Take the extras (nuts and dried fruit, each in a 100 calorie package — pass on the giant package of brown sugar and instead hit the cinnamon canister near the creamer stuff on the way out). Eat the extras LATER as a snack. This way you spread out 300 calories and your insulin will work in neat little spurts that will be extra good for your soul. What? You aren’t rich? Me either. Damn. Well, anyway, here’s another way: Buy yourself some plain, bulk oatmeal (quick cooking rolled oats — about a buck a pound even at Whole Foods), a little jar of cinnamon, and a few of those little boxes of milk if you like that sort of thing. It’s cheaper to buy a carton and leave it in the fridge at work, but if you forget to bring one on a Monday, it’s nice to have those little cartons on standby. If you can find a cheap set of measuring cups at the 99 cent store, bring that too. 1/2 cup of oatmeal to 1 cup water or milk. Microwave for 2 minutes, hit with cinnamon instead of sugar. Add a few raisins — a tablespoon! — if you’re feeling jaunty (or in need of potassium). Bring a banana? Still soothing, goes well with coffee, but it’s good for ya. Also, while people will steal your granola bars after hours, they generally don’t go after the raw oatmeal. Did I just say you can never have sugary cereal? I did not. Don’t have it daily, and maybe just do a half cup of the stuff with a bit of fruit or plain yogurt into which you have lobbed a teaspoon of all-fruit jam. Allow yourself some balance in life or you’ll find yourself on your knees in someone else’s cubicle hunting for the marshmallows in some poor schlub’s Lucky Charms after every one else has gone home.